We usually hear about poldets (portmanteau of ‘political detainees’) producing a corpus of poems while inside the prison. Political exile Jose Ma. Sison’s came up with his prison book “Prison and Beyond” which won for him a Southeast Asia WRITE Award in 1986. In the recent decade, we have former political prisoner Axel Pinpin, whose poetry book “Tugmaang Matatabil: Mga Akdang Isinulat sa Libingan ng mga Buhay” was a finalist at the 2010 Madrigal-Gonzalez Best First Book Award, while Ericson Acosta, whose “MULA TARIMA HANGGANG At Iba Pang Mga Tula At Awit” is fortcoming. Eduardo Sarmiento, National Democratic Front of the Philippines (NDFP) peace consultant, finished “Susmatanon: Mga Kwentong Pambata”, a compilation of children’s fiction, while in detention at the Philippine National Police (PNP) Custodial Center in Camp Crame.Susmatanon is a Waray word for “fiction”. A native of Catarman, Northern Samar, Sarmiento represented Eastern Visayas in the NDFP peace panel in 1986. 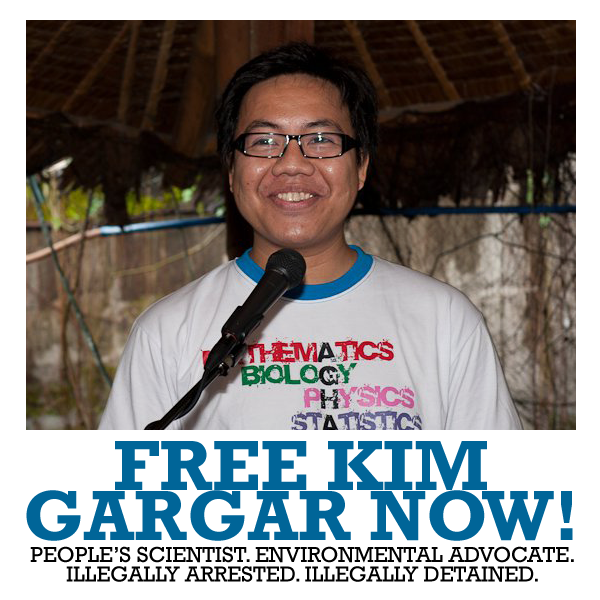 He is one of the 13 NDFP consultants currently detained under the Aquino administration. He selected six children’s short stories for his book which was made on a sketch pad. Some of his stories are placed in his native Samar (“Baryo Maligaya at ang Halimaw”, “Si Pagong at si Gamaw“, and “Ang Uwak”) from the fictional Baryo Maligaya and Mount Mabaysay (mabaysayis the Waray word for “beautiful”) to Mount Huraw. His stories “Ang Dalawang Puno ng Abokado”, “Si Pagong at si Gamaw”, and “Ang Batang Sinungaling” pays tribute to Aesop’s fables. Gamaw is the Waray word for the bird species called grebe. Aside from writing the stories, he also did the illustration and book design. “Susmatanon” is a quintessential collection for children’s fiction lovers, especially those who are identified with the national democratic movement. No doubt killing the three-headed dragon, reminiscent of Ghidorah and Chimera, in the story “Baryo Maligaya at ang Halimaw”, brings to light the Maoist overthrow of imperialism, feudalism, and bureaucrat capitalism. The story “Ang Palaka sa Balon” is a homage to the ‘frog in the well’ analogy mentioned in Mao Zedong’s Little Red Book. On February 24, 2009, Sarmiento was arrested without warrant by he PNP and military agents in Alabang, Metro Manila. He was presented to the media as a high-ranking leader of the revolutionary movement in Eastern Visayas. On the contrary, he was then attending consultations related to the peace process between the NDFP and the Government of the Philippines (GPH). The human rights group KARAPATAN asserts he was accorded protection under the Joint Agreement on Safety and Immunity Guarantees (JASIG) between the GPH and the NDFP. He was also entitled to due process and lenient treatment under the GPH-NDFP Comprehensive Agreement on Respect for Human Rights and International Humanitarian Law. Sarmiento was sentenced to 40 years imprisonment by Judge Myra Bayot Quiambo of the Muntinlupa Regional Trial Court (RTC) Branch 203 on December 11, 2013 on the basis of trumped up criminal charge of illegal possession of firearms and explosives. Aside from children’s stories, Sarmiento also writes poems and composes progressive songs. Maaari po ba namin itong gamitin sa storytelling activity ng aming organisasyon? maraming salamat po.